TOUCHDOWN! 7 WATERMELON IDEAS FOR YOUR NEXT TAILGATING PARTY - What About Watermelon? Summer is my favorite season, but fall isn’t so bad, either. I like the crisp, coolness in the air and all of the pumpkin-flavored goodies that make their annual appearance. As a football fan, I also like fall because it signals the start of tailgating season. If you’re looking for some inspiration for your next tailgating party, you’d be wise to start with a visit to the “Recipes” section of the National Watermelon Promotion Board website. Below are just a few ideas I found on the website to help take you next tailgating event to the next level. A watermelon keg – Okay, this is more of a carving than a recipe, but you’ll find lots of ideas for beverages to put in the keg on the “Drinks” page of the website, too. Watermelon BBQ Sauce – This sauce is easy to make, and it goes great on just about anything you might be grilling. Watermelon Glazed Mini Barbeque Meatballs – If you love meatballs (and who doesn’t? ), you’ll love these meatballs made with a watermelon barbeque sauce. Pulled Pork with Watermelon BBQ Sauce – A little pulled pork at a tailgating event is never a bad thing, right? A little pulled pork with watermelon? Even better. Chipotle Maple Citrus Watermelon Wings – Wings are a staple of any football party, and these will not only score you some points, they’ll probably be the game-winning touchdown. Flash Grilled Watermelon Cheddar Burgers – This recipe is so simple, you have no excuse NOT to make it. Just grill up a slice of watermelon and slap it on top of a burger. That’s it! 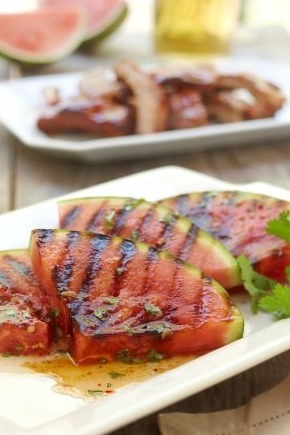 Grilled Spicy Watermelon – As long as you’ve got the grill fired up, you might as well throw a few of these spicy watermelon wedges on there.